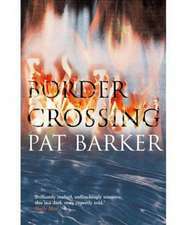 Pat Barker's novels include "Another World", "Border Crossing" and "Noonday". She is also the author of the highly acclaimed Regeneration Trilogy, comprising "Regeneration", which has been made into a film starring Jonathan Pryce and James Wilby, "The Eye in the Door", winner of the 1993 Guardian Fiction Prize, and "The Ghost Road", winner of the 1996 Booker Prize. She lives in England. Autor original Pat Barker et al. De (autor) Pat Barker et al.